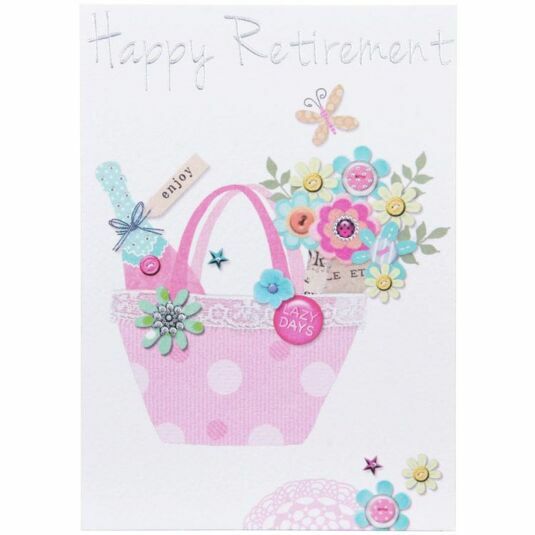 The pretty design of this card features the words ‘Happy Retirement’ in an embossed silver script, below which sits a hamper filled with flowers and champagne bearing the word ‘enjoy’. Silver embossed details complete the design. The inside of the card reads ‘Congratulations and enjoy’, and it comes with a silver envelope. Paperlink is one of the greeting cards industry market leaders, specializing in contemporary and humorous cards. Founded in 1985, the Paperlink collection encompasses all occasions and the designs include beautiful imagery, funny cartoons and witty typography - a card for everyone! The Made With Love card collection has a handcrafted look, featuring facsimile printed fabrics, buttons and stitching. The pretty colours are complemented by embossed silver details and the paper has a handmade textured feel.